Field Commander Napoleon is a solitaire board game which puts you in the driver's seat on many of Napoleon's greatest campaigns. It is part of the Field Commander series from Dan Verssen Games, which includes other titles covering the likes of Alexander the Great and Erwin Rommel. Faced with some of the same challenges as the Little Corporal himself, will you be able to emerge victorious? 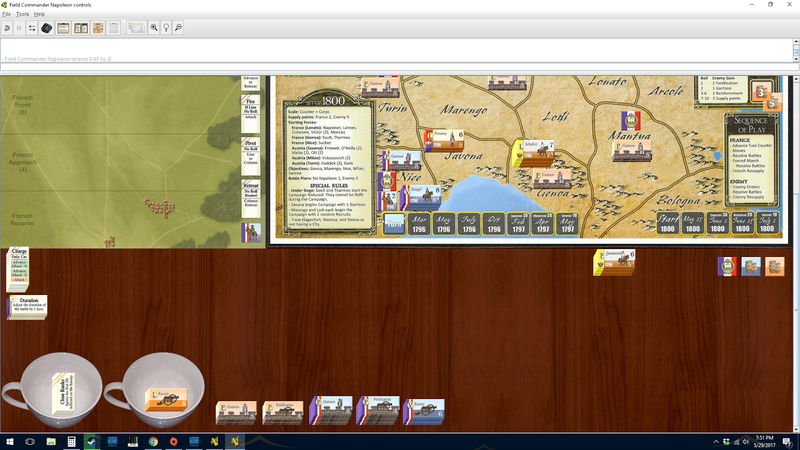 My review here focuses specifically on the Vassal module for the game. Since this game has been out for many years, and there are a thousand reviews for it online, I will focus this article on the Vassal element itself, and summarize my opinion of the game at the end. If you are not familiar with VASSAL, it is a free and open source engine for running digital versions of hundreds of board and wargames. These "modules" vary from completely free, but in many cases limited versions of games, on up to paid for versions that include everything you would find in the actual box. FC Napoleon falls into the more premium category, with a price of $30. However, you are getting essentially the equivalent of owning a physical copy, with all the pieces and boards crisply displayed on your PC screen. I should note up front to make it clear, this is not a "PC game" so much as it is a simulation of playing the board game. While the game neatly organizes all the pieces for you at the start of a campaign, it is up to the player to then move the pieces around the board correctly, and follow the rules. I'm lucky enough to have a copy of the physical version of the game, which is absolutely gorgeous and worth its rather hefty price tag. Since I've played the game before, I only needed a brief review of the rules to get started. This, however, is where I ran into a snag with the Vassal version, it doesn't seem to include the game manual. Perhaps I am completely missing it, but I searched through every menu and button in the module and could not find it. There are handy buttons to open up the various player aides in separate windows, and a useful guide for veteran players getting comfortable with some nuances of playing in Vassal, but the actual rules for the game are nowhere to be found. I'll happily edit this section if anyone can point out its location to me. I was able to quickly Google up a a PDF of the manual and get rolling, so it isn't an insurmountable hurdle. While playing in Vassal certainly won't be for everyone, it does offer a bevy of advantages over the physical realm of board gaming. First and foremost, game setup takes all of half a second. Just pick the campaign of your choice, there are eleven to choose from, and away you go. This is especially nice for FC Napoleon, the physical version of which includes triple digit quantities of unit counters, many specific to each campaign, which must be sorted out and placed meticulously according to each scenario's opening game state. What might take twenty minutes with the physical version takes only a split-second in Vassal. Just as nice is the ability to save your game and close the program any time you please. No need to leave things set up on the dining room table for a week, open to devastating attack by cats and small children. Navigating the game through Vassal takes some getting used to. Perhaps more so for me than other players, since I had not used Vassal before. Right-click menus and other shortcuts allow you to perform the various actions of the game, such as flipping and rotating counters, creating/separating stacks of counters, and increasing/decreasing the value of certain spaces like supplies. One very nice feature is that units can be moved from the operational map to the battle map using a short-cut, which will also prepare everything you need for the battle (such as laying out the Battle Plan counters you will need, then stacking them up when the battle is done). However, using this feature is a bit precarious, as the module guide indicates, because the game isn't quite smart enough to realize if you've done something horribly wrong while moving counters around. The player will still need to pay attention to the details. Another automated function in the Vassal module is that reinforcements will move onto the campaign board as soon as you meet the appropriate conditions, which is nice and leaves you with one less thing to remember. I found that playing in Vassal required a serious mental adjustment on my part. This is neither a truly interactive computer game, nor is it as intuitive as playing the game directly with your hands. Vassal veterans may have an easier time making the adjustment, but for me it took a few hours of tinkering around before I really felt comfortable playing in this environment, despite having experience with the game itself. However, once I found my feet on this new gaming battlefield, I could appreciate why it is so popular with many wargamers. The obvious advantages of instant set up and saved games makes it so much easier to play a game like this on a whim, compared to the sizable time commitment involved in breaking out the physical version. That said, at the fairly steep price of $30, you will have to know that you'll like this before taking the plunge. I can't help but think that anyone who can afford to spend that much on a Vassal module, could probably afford to go ahead and get a physical copy. 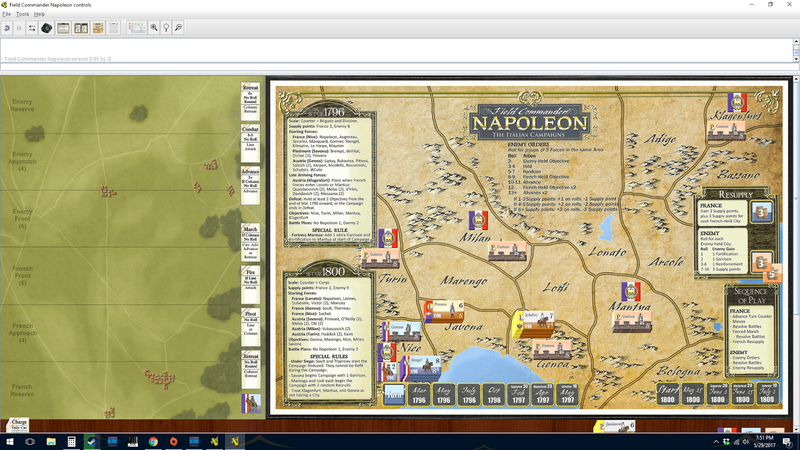 Regardless of price, my verdict on the Vassal edition of FC Napoleon is that it fully translates the board game experience onto the PC, while adding several quality of life improvements. I did not run into any bugs or other problems while using this version of the game. 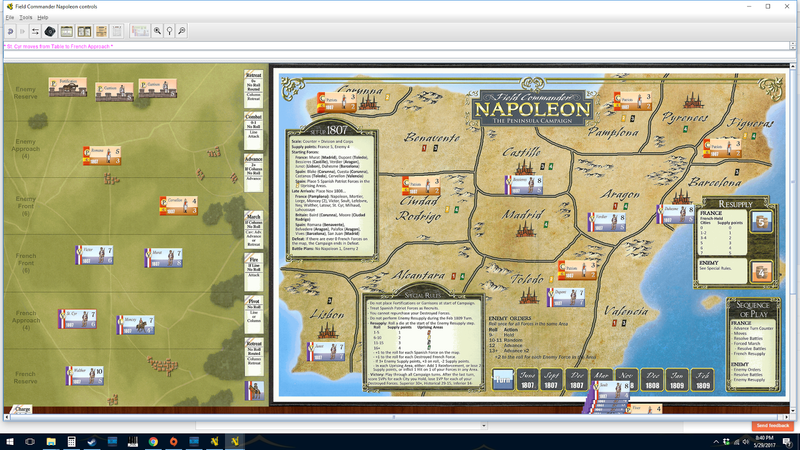 As for Field Commander Napoleon itself as a game, I can confidently say that it is one of the better solitaire gaming systems I have played. The mix of operational force movement and the more tactical battlefield phases of the game gives you a lot to think about. The enemy AI is simple, but effective enough in that it will keep you on your toes and force you to react to the situations that develop in each campaign. At many points in the game you will be faced with the decision of playing conservatively or aggressively, with the greater rewards carrying greater risks. Just like Napoleon, you will more often than not need to be bold in your actions, and trust to your superior forces and leadership to see you through against the odds. With almost a dozen scenarios to play, the game has plenty of variability and it will take quite a while to win them all. 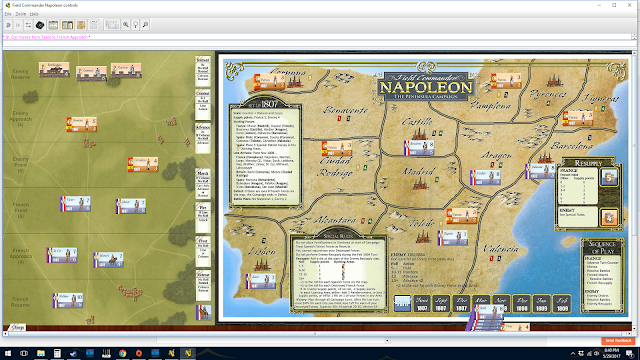 In short, this a well done Vassal module of a very good game. Whether it is worth the purchase price is up to you, but you can make that decision knowing that you will get a quality product. Many thanks, Joe. If you enjoyed this, then I hope you'll have a look in at my review of the physical version of Field Commander Napoleon that will be appearing in a few weeks time.